Origin and Habitat: Garden origin: The natural species comes from Mexico (Tamaulipas) where it grows among rocks, on fertile soils rich in dark organic material produced by the decomposition of vegetable matter in open pinion woodland, 700-1400 mt altitude. 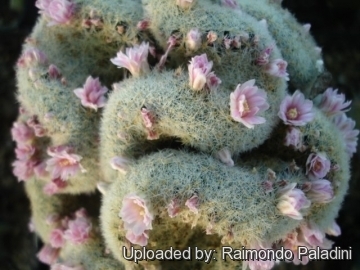 Description: The typical Mammillaria schiedeana subs. 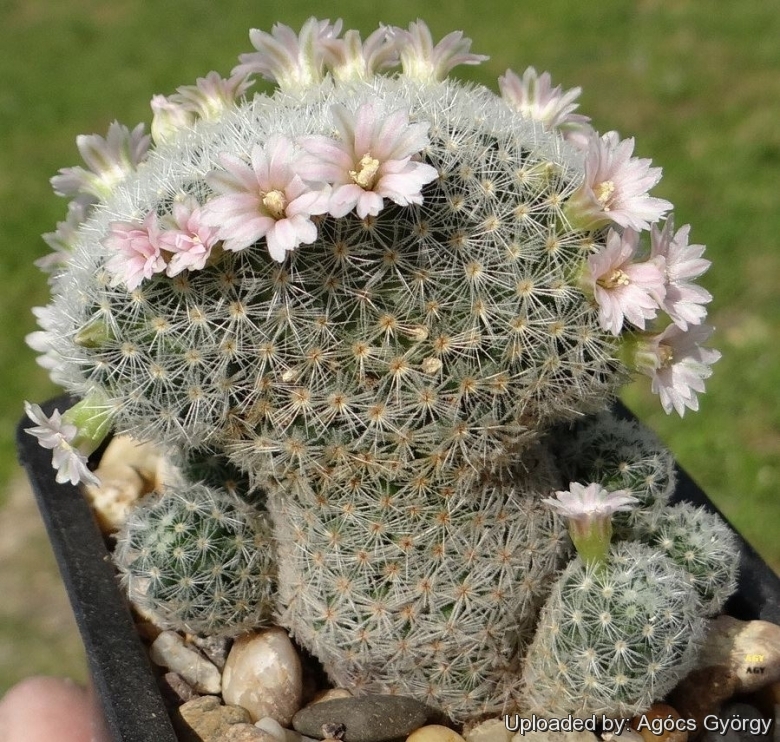 giselae (Mammillaria giselae) is a small clustering cactus with up to 15, or rarely as many as 35 stems. Individual cluster up to 10 cm in diameter (or more in cultivation). It has about 16-21 radials ( 2- 5 mm long), fine, needle-like, feathery, flexible, somewhat pectinated, white, yellow to almost orange and few very central set between the series of radials and very short, from 0.17 mm long. The flower are pale pink to pink, with darker, narrow midstripe. Crested form: The crested form is cultivated for its fan shaped stem with dense bristly spine. Flowers are produced on the the apex of crested stems too. Crested specimens are often grafted on stronger species, called the stock, that can be any number of different columnar cactus. 2) F. Anderson (2001) “ The Cactus Family”.